It's selecting and isolating the dust that I can't figure out. There's not always an easy way to do that. You may have to draw the dust by hand or something. I'm not sure, I've never worked on that model obviously. Obviously you'll want to work on a separate layer. Yeah, I may have to do that for NGC 7742, but I'm using the M51 galaxy atm to try and figure it out. Here's a nice way to separate dust from the galaxy in photoshop. -set the top layer to color burn or linear burn. And then what, merge the two layers? I'm a complete newb with the layers, sorry if I'm giving you guys a hard time about it (which I don't mean to). I just tested it and it's pretty effective, especially for isolating the spiral arms. And then what, merge the two layers? Here's an attempt using that method for M51, or maybe the inverted version of that would work. I'll have to experiment around with gaussiab blur levels to see what works best. Edit: Wait, or maybe increase contrast? If the background is supposed to be black that is. 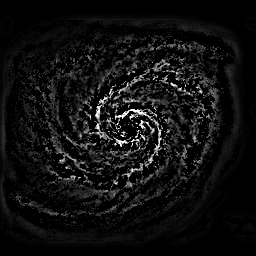 Edit2: I'm definetly getting the idea, and it looks very close to the example for M51, however, now I need to figure out how to transfer the thing on top of a white background layer. You can experiment with the levels or curves. You mean flatten the image? I was looking at the M51 example and I wasn't sure if I needed to put a white layer under it or something. Will check out the color curves. now I need to figure out how to transfer the thing on top of a white background layer. Why do you need to transfer anything? Don't you just need to implement that as the alpha channel for the base galaxy image? For that just create a layer mask for the base image, click on the mask to make sure it's active (layer should be outlined in green instead of the normal yellow) and make sure it's the top layer. Then click on the layer with that dust info, select all, copy, paste. Then right click on the pasted layer in the layer tab and click Merge Down. That should move it into the layer mask. Then you just apply the layer mask and you're done. You've got your alpha channel. Edit: NVM, I fooled myself, the background was just what got put up as a new page. Any tips on getting this to look better. I'm getting it CLOSE to the example, but not quite. Not sure if it's because of the image I'm using (the RGB one on the first page without lettering on it) or if I'm missing some trick here. I know I need to remove the core, but one problem at a time. I'm aware of the halo around the galaxy there, but I'm not going to be using that for an alpha anyway. Any tips on getting this to look better. Get rid of that glow around the perimeter. Otherwise I think it looks pretty nice. Anybody have a 2048x2048 image of M51 with the same resolution as the sys image? I'm trying to calibrate the color curves in GIMP so that I can see what good color settings look like. Unless theres a better way to do it than using the color curves. Anybody have a 2048x2048 image of M51 with the same resolution as the sys image?